Bengaluru: Tata Consultancy Services Ltd (TCS) said it won’t engage in a price war, although some of its rivals have offered discounts, to win new deals. “We are seeing in the market some of them are dropping prices," chief operating officer N. Ganapathy Subramaniam said without naming the companies that are resorting to discounts to boost revenue growth. “We are not worried about the pricing play of our competition because we have always maintained you cannot compromise margins to funnel growth." Examples abound in the world of business of how retaliatory price slashing results in a precipitous drop in industry profitability. With TCS’s December quarter (Q3) operating income of $1.35 billion is almost double that of its nearest local rival Infosys Ltd, the Mumbai-based company can use other tactics in its arsenal to stave off the debilitating effects of a price war. “Pricing alone is not the criteria. So, when we say we will be aggressive, what we are saying is that you need to have a solution, the sleekness of the solution, the ability to create business value, and how you are committing to growth parameters (of a client). All of this makes a winning proposition for clients," clarified Subramaniam. Some analysts had interpreted that TCS might lower its pricing in some work it does after the management told analysts in a post-earnings interaction on Thursday that the firm plans to participate aggressively when it spots a demand opportunity. TCS reported a Q3 operating margin of 25.6%, about three percentage points wider than Infosys’s 22.6%, highlighting how the Mumbai-based TCS is generating more revenue at higher profitability. 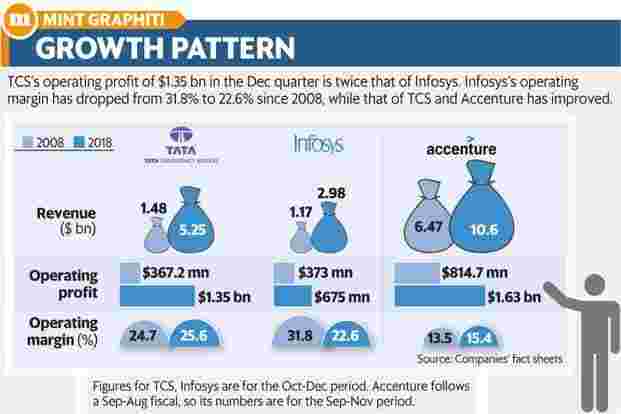 Significantly, until the Q3 of 2008-09, Infosys earned more for its services offered, as its $373 million in operating profit was more than TCS’s $367.2 million. TCS said it continues to work towards operating between a 26% and 28% profitability band, even as Infosys in April last year dropped its profit outlook to between 22% and 24% for the current fiscal. Many analysts say this was on account of the company looking to drop prices for its services, although Infosys maintains that the reason for the lowering of profitability is to plough back the savings to invest in digital technologies and also cover expenses related to hiring more locals in the US and pay more to hire the brightest engineers. The underlying reason for declining profitability at Infosys and other large IT firms, including Wipro Ltd and HCL Technologies Ltd, is that there is pricing pressure on commoditized deals or traditional information technology work, which still account for over three-fourths of total revenues. These firms maintain they earn more money on work related to digital, the fuzzy umbrella term that each firm uses to call revenue generated from areas generally classified as social, mobile, analytics, cloud computing, and Internet of Things. However, digital still brings less than a third of the overall business. Worryingly for investors of Infosys, some analysts say the company’s profitability will remain challenged in the current quarter and will be unchanged in the fiscal beginning April. “We project margins to be roughly flat in FY20," Keith Bachman, an analyst with BMO Capital Markets, wrote in a note dated 11 January. “We think margins will be lower sequentially in 4Q, as INFY (Infosys) will have a negative impact from INR appreciation, and has continued expenses in localization, reskilling, and compensation changes to help lower attrition. Also, we think there is a ramp time for new deals, which we expect will also weigh on margins in 4Q. In FY20, we project 23.0% operating margins, as we think investments will stabilize though FX will be a headwind," wrote Bachman.